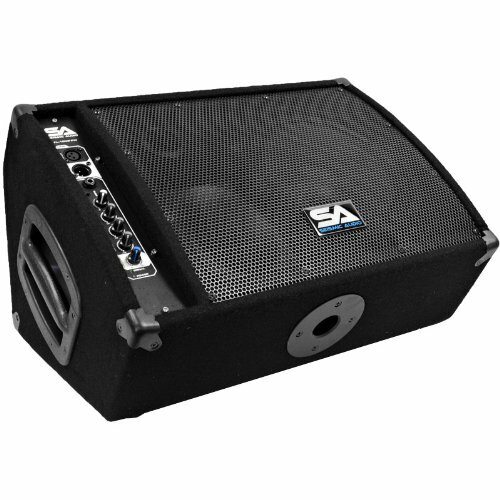 Premium Powered 2-Way 10" Floor / Stage Monitor with Titanium Horn - 250 Watts RMS - PA/DJ Stage, Studio, Live Sound Active 10 Inch Monitor MODEL: FL-10MP-PW. CONTENTS: Powered 2-Way 10" PA Monitor. CONDITION: New. APPLICATION: PA Floor Monitor / Live Sound / Stage / Studio. ACTIVE/PASSIVE: Powered / Active. WOOFER: 10" Loudspeaker. WOOFER SPECS: 60 oz Magnet and 2" Voice Coil. POWER: 250 Watts RMS; 500 Watts Peak each. FREQUENCY RESPONSE: 65 Hz - 20k Hz. SENSITIVITY: 96 dB. SPL: 105 dB. CONNECTORS: Two Line Input/Output - XLR Female / Male XLR 3.5 mm Input for MP3, iPod, iPhone, iPad. NOMINAL IMPEDANCE: 8 Ohms. PORTS: Yes. GRILL: Full Metal Grill. HANDLES: Metal Recessed. COVERING: Black Carpet with Black Metal Corners. ENCLOSURE: 7 Ply Birch Plywood. POLE MOUNT: Yes - One on bottom and one on side for use as a Main. HEIGHT: 21.75". WIDTH: 13". DEPTH: 14.75". WEIGHT: 36.3 lbs per Cabinet. WARRANTY: One Year Warranty. SPECIAL FEATURES: Can be Daisy Chained. SPECIAL FEATURES: Class AB Amplifier-Power Select 110V-120V or 22V-240V Power Supply. SPECIAL FEATURES: 3 Band EQ - Treble, Mid, Bass. SPECIAL FEATURES: Gain Control - Volume Control. SPECIAL FEATURES: Separate Amplifier Panel on front for easy controlThe Seismic Audio PW series of Powered / Active Monitors are ideal for any Pro Audio application. Whether you are doing live sound, in the studio, an emcee, a DJ gig, or karaoke...The ability to hear yourself on stage is essential. The FL Series of Powered Monitors give you a true sense of your sound!